The 2018 World Cup will mark Javier Mascherano's final tournament for Argentina if he is chosen, the veteran confirmed. 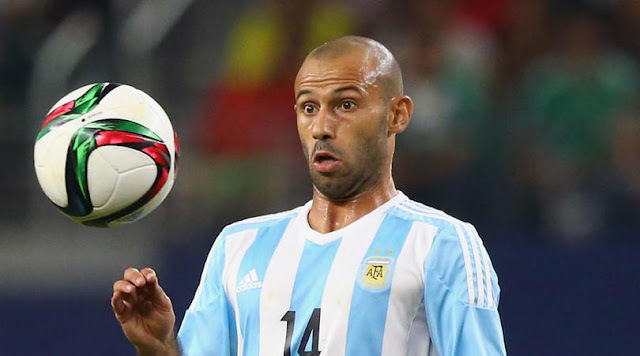 Argentina veteran Javier Mascherano confirmed he would retire from internationals after the 2018 World Cup in Russia. A Lionel Messi hat-trick led Jorge Sampaoli's men to a 3-1 win over Ecuador on Tuesday, securing a place at the showpiece event. Mascherano, who has won 139 caps – just four shy of the nation's all-time record held by Javier Zanetti, said Russia 2018 would mark the end of his international career. "My cycle in the national team finishes in Russia," the 33-year-old Barcelona man told TyC Sports on Thursday. "I have been clear that it will be my final point." Mascherano has been used in midfield and defence for Argentina, who struggled in qualifying and were in danger of missing the World Cup before Messi's heroics. The former Liverpool midfielder said he hoped to be in Russia, but added it was a decision for Sampaoli. Mascherano said: "The decisions are taken by the coach and he will decide if I am in Russia or not. "I will try in these six or seven months to prepare to be able to be. Sampaoli will decide. "I have a lot of respect for the decision that coaches make."